The perfect destination for a day or evening adventure! In the 1800s the famous mineral springs drew the city elite from their congested abodes to the tranquility of the country. Fashionable Victorians strolled the streets, sipped from the fountain springs and bathed in the restorative waters, enjoying the fresh air and social summer climate of this small city in the country. The Saratoga Racetrack opened its doors in August of 1863, drawing an even larger high society crowd. At the city's height of popularity, August's social scene read like the first class passenger list on the Titanic. Morgans, Vanderbilts, Rockefellers and Whitneys presided over elaborate summer soirees. Saratoga was truly the place to see and be seen. Today, this charming historic city retains its sophistication while maintaining a casual allure that attracts visitors year-round to fill the many restaurants, cafes, and night clubs the area offers. The flat track, the oldest operating track in the United States, still reigns supreme during a summer season that brings visitors from around the globe. Unlike days of yore, shorts- and jeans-clad bettors mingle among ladies dressed in fashionable summer dresses and hats, but like yesteryear, this is still the place to see and be seen. Now known as the Saratoga Casino Hotel, the Harness Track operates year-round and also houses a "Racino" with over 1300 video gaming machines. Summer brings out the stars at SPAC (Saratoga Performing Arts Center) with jazz festivals, well-known performing artists, the Philadelphia Orchestra and renown dance troupes. Historic Saratoga Springs also features a downtown shopping district with lovely boutiques and quaint shops tucked among wonderful eateries and cafes. Only a couple larger chains have made inroads into this charming area (and, of course, the ubiquitous Starbucks) keeping the ambiance and spirit of a turn-of-the-century downtown alive. A few miles away from this historic district is a large collection of malls, chain stores and restaurants near Exit 15 of the Northway (I-87). 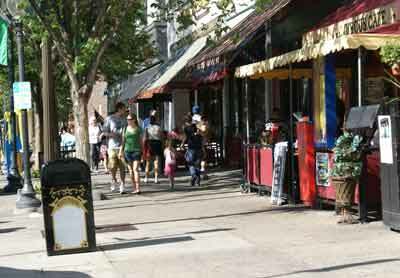 This provides the Saratoga Springs area with one of the largest and most concentrated shopping districts north of Albany. Whether you come for a day or simply an evening's entertainment, you will surely want to return to the Saratoga area again. The area offers a wide variety of lodging venues, including stately Inns and homey B&Bs; charming hotels and motels, as well as a large number of vacation rentals and cottages. Just a few hours spent in Saratoga, and you will quickly discover what has captivated so many for generations past and generations to come.